A late winner from Heung-min Son gave Spurs a hard-fought victory over Newcastle at Wembley in the early kickoff on Saturday. The South Korean’s effort from the edge area squirmed under the body of Martin Dubravka to give Spurs all three points and maintain their grip on third place in the Premier League. Despite being a slight doubt, Son started the match for Spurs on the left wing with Lucas Moura, who was starting a Spurs game for just the third time since Christmas, leading the line. Meanwhile with Ben Davies injured and Danny Rose rested, Jan Vertonghen started at left back in a 4-2-3-1 formation. Newcastle remained unchanged from the side that defeated Manchester City in their last encounter, with new signing Antonio Barreca on the bench. Spurs had the first key chance of the game, which should have really been taken by Lucas Moura. After a free kick out wide, Erik Lamela picked up the ball on the edge of the Newcastle area and put in a cross to the unmarked Moura. The Brazilian did not realise how much time and space he had and snatched at his header, which went wide of Dubravka’s post. It was a chance which Fernando Llorente would’ve loved, but the Spaniard was on the bench after starting in Spurs’ last four matches. Lamela nearly opened the scoring for Spurs soon after with a header from six yards out. The opportunity came after Jan Vertonghen whipped in a cross, which Lamela caught on the bounce with his head but saw his effort crash off the bar. Moura could not turn in Trippier’s ball in afterwards and Newcastle were once again let off the hook by Spurs. However it wasn’t all one way traffic in the first half and after thirty minutes Newcastle had an opportunity to score. Matt Ritchie found himself in acres of space on the left hand side for the Magpies and played the ball into Ayoze Perez who completely scuffed his shot. Salomon Rondon then had a go, but a combination of Vertonghen and Christian Eriksen were there to block. 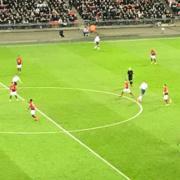 Spurs sustained the pressure they had put on earlier in the half with Vertonghen having a chance and Kieran Trippier finding plenty of prospects down the right to cross. Moussa Sissoko then had an opportunity to score against his former club from a corner. The French international had dropped off to the edge of the area and caught Eriksen’s delivery on the volley with the side of his foot. His controlled effort was on target, but Dubravka was able to get down low to save and Newcastle were able to clear. Sonny saves the day at Wembley! 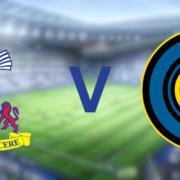 In the second half, it was Newcastle who started brightly and could have took the lead through target man Rondon. After good work from Sean Longstaff and Rondon, former Spurs right back DeAndre Yedlin picked up the ball and put in a wicked cross for Rondon to get on the end of. Hugo Lloris was nowhere near his header but, fortunately for Spurs, it bounced off the post and Spurs were able to clear. After sixty minutes, Fernando Llorente was brought on for Moura to give Spurs more of a presence up front. Soon after, Spurs came the closest yet and were only denied by a sensational clearance from Newcastle defender Fabian Schar. An Erik Lamela corner was flicked on by Christian Eriksen, who was on the Newcastle front post, and looked to be going in but Schar scrambled back and hooked clear. The goal decision system revealed just how close Eriksen was to opening the scoring as almost half of the ball was over the line. The game became more stretched with Spurs pushing for a much needed opener, yet Newcastle went close again through Ayoze Perez. After good hold up play by Rondon, Perez gathered possession outside the Spurs area and had Matt Ritchie outside him unmarked. The Spaniard opted to go alone, which looked to be the wrong choice, but his effort almost went in and needed a solid save from Lloris, who was called into action for the first real time in the encounter. By now, Newcastle looked like they would settle for a point and the onus was on Spurs to break the deadlock. Llorente had a header which went over, mainly because the sun blocked his vision and a Spurs corner again caused trouble for Newcastle, with a combination of Llorente and Eriksen going close. Going into the final ten minutes it looked as though Spurs were not going to get the goal. That was until a hopeful ball was put up to Llorente, who managed to chest down to Son. His first touch gave him the opportunity to shoot and he fired an effort at Dubravka, who failed to deal with it as the ball crept under his body. The goal came in scruffy circumstances but that would not have bothered Pochettino and Spurs one bit. It was a deserved opener for the Lilywhites, who has pressed all afternoon for a goal and Son kept up his incredible goalscoring run in a Spurs shirt with the winner. Heung-min Son was once again the best player for Spurs and continues to fill the void left by Harry Kane, scoring important goals at important stages. 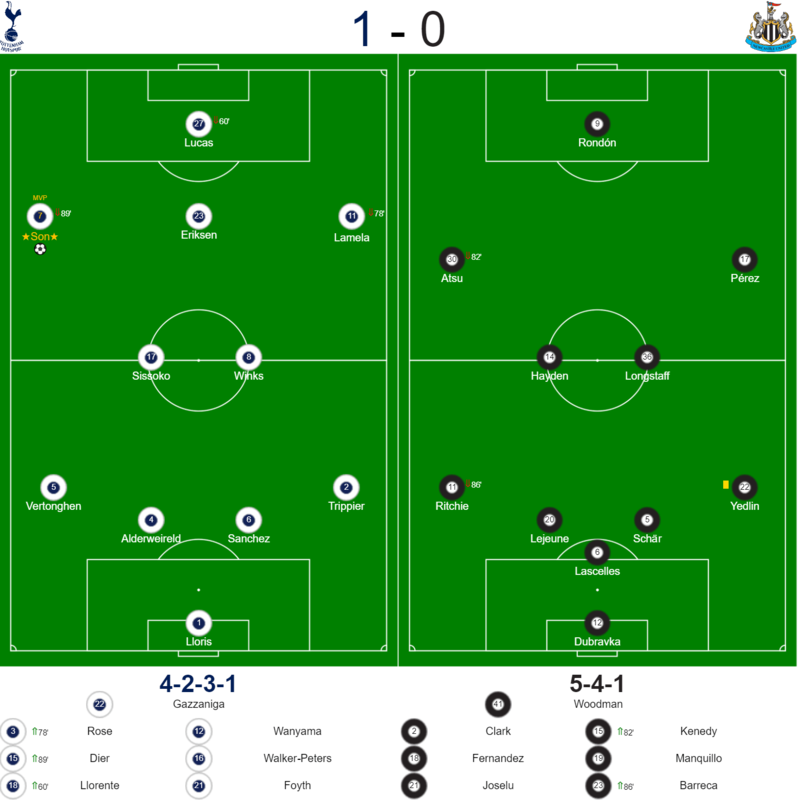 The South Korean operated on the left hand side and was a constant menace for the Newcastle backline. His sixteen sprints were also the most of any player on the pitch. Spurs have scored late winners in their last three Premier League matches, against Fulham, Watford and Newcastle. The win means Spurs have gone 29 Premier League games without a draw, which is now a Premier League record. Heung-min Son was involved in his fourteenth goal in his last ten Spurs matches. Fernando Llorente has provided assists in back to back league games for the first time since March 2008 for Athletic Bilbao. 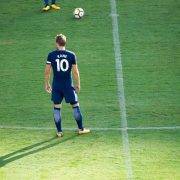 Eric Dier has now made 200 appearances for Spurs. 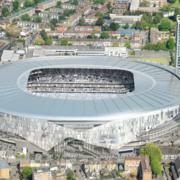 Spurs do not have a midweek game for only the second time since November, with their next fixture on Sunday 10th February at home to Leicester at Wembley. Then they are at Wembley for the fourth match in a row when they host Borussia Dortmund in the first leg of the Champions League first knockout round.